Co-Creation : What is it about ? Co-creation is a relational practice through which stakeholders (in an organization or in society) engage in a dialogue in order to 'make knowledge', define direction and purpose, solve problems, innovate or create products or processes, learn from each other, etc... This can happen in very different contexts and can involve internal or external stakeholders or both. As an OD alternative for the implementation process during organizational change. 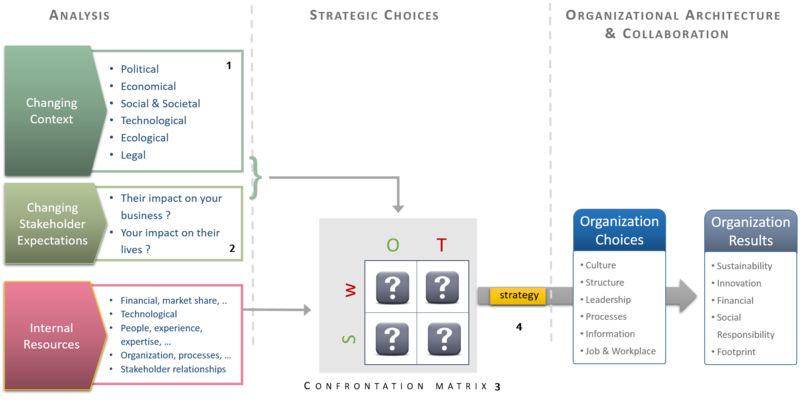 The concept of Co-Creation and the different methodologies that have been developed or borrowed to bring it in practice (such as : Appreciative Inquiry, Future Search, Open Space, World-Café, Multi Party Cooperation, Story Telling, enz ...) are often based on the principles of constructivist learning theory and vision. The general idea is that in a fast moving, and volatile world you wont have 'facts' or 'truth' anymore, and so meaning of things has to be constructed all over again, in a relational practice with all stakeholders : a participative dialogue inventing the future (or better our future). "In times of a network/participatory society, value co-creation should be at the heart of all corporate activity, where all stakeholders can bring their skills and resources to exchange, create, and determine value together" (Source : Camargo-Borges & Rasera., (2013), Social Constructionism in the Context of Organization Development: Dialogue, Imagination, and Co-Creation as Resources of Change. Sage Open, April-June, 1-7). That's the reason why co-creation and the constructivist vision go so well together with the Learning Organization. For co-creation a number of very specific methodologies have been developed but also more classical methodology can be build in into a co-creative process as long the focus in on dialogue and not on diagnostics. Some examples of 'hired methodologies' are : Force Field Analysis, metaplanning, mindmapping, scenario planning, brainstorming, etc... Sometimes the word 'Collaboratory' is used to describe an open space, creative process where a group of people work together to generate solutions to complex problems. Co-Creation : Why would you use it ? Stakeholder needs and impact are taken care of from the very start of the product or service design process. Through the co-creative process all involved develop a profound insight in why strategic choices are made, they develop with the other stakeholders a clear shared purpose for the organization and that develops a deep 'ethic of contribution'. 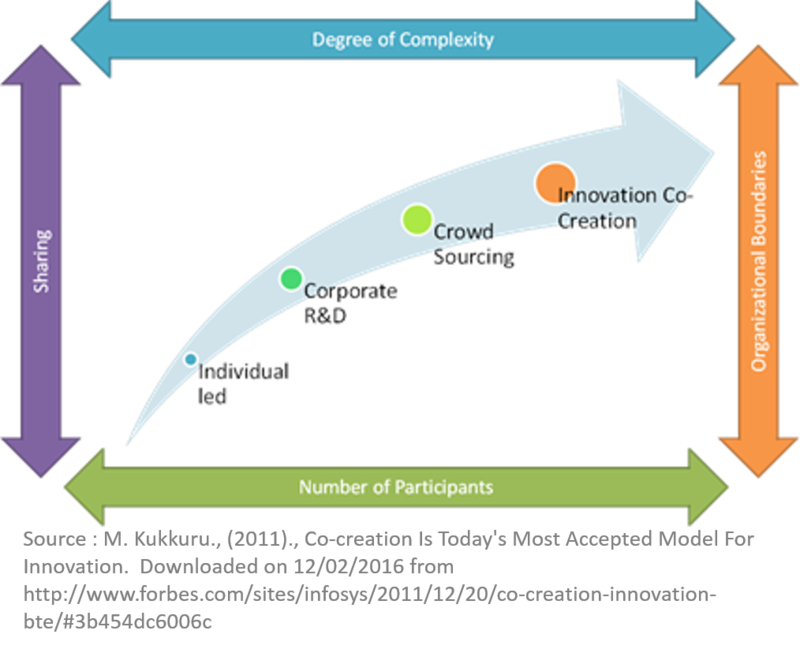 Co-Creation and distributed leadership are conditions for sustainable development of organizations because they are the 'instrument' of the necessary re-engineering to make organizations suitable for success in a VUCA world, because it brings expertise and experience together and enables a creative change process. 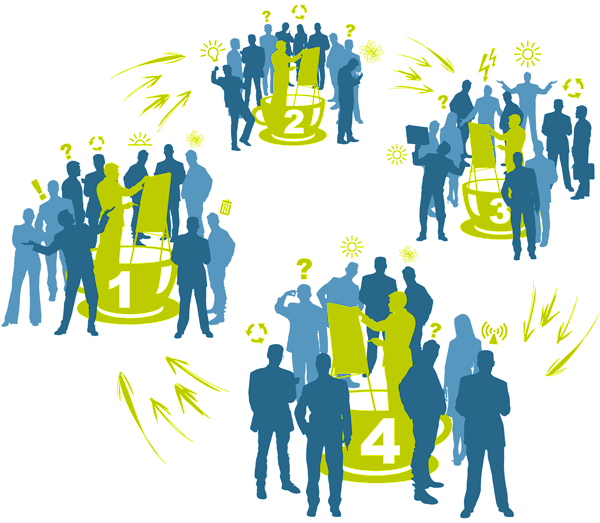 Co-Creation : When to use it ? develop ownership with all those who will eventually involved in the execution of the decisions so that they can easily contribute, take autonomous decisions, create collaboration with other stakeholders, etc... You enable a swift and flexible execution of the decisions throughout the organization. In the procesflow picture we depict the main elements of the strategic process. For each of those steps exist a large number of methodologies and tools to make it truly co-creative. Move! created a few job-aids to ensure the quality of some of these steps. You can download the tools numbered in function of the position they take in the strategic process. 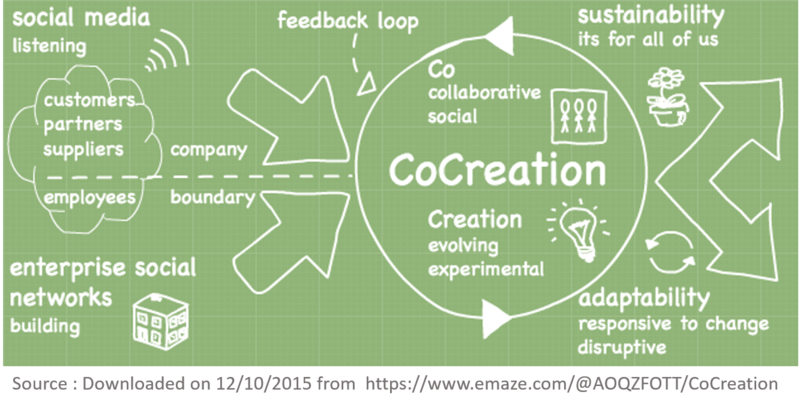 Co-Creation : How can Move! support organizations ? 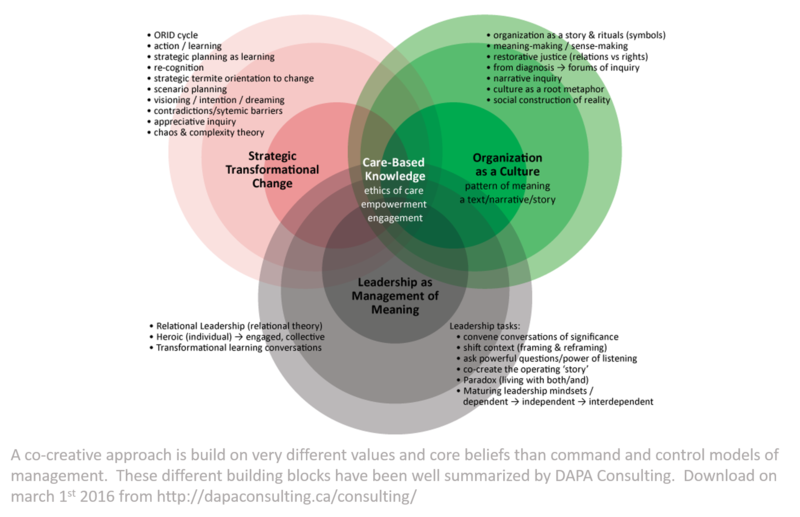 Apart from the methodology, the core paradigms around organizations, leadership, knowledge, learning, based on social constructivism, are fundamentally different form those applied in scientific management and diagnostic HR and OD. This is a picture taken from a co-creative activity or 'Collaboratory' where they use the fishbowl methodology. This picture is taken from a book 'The Collaboratory. 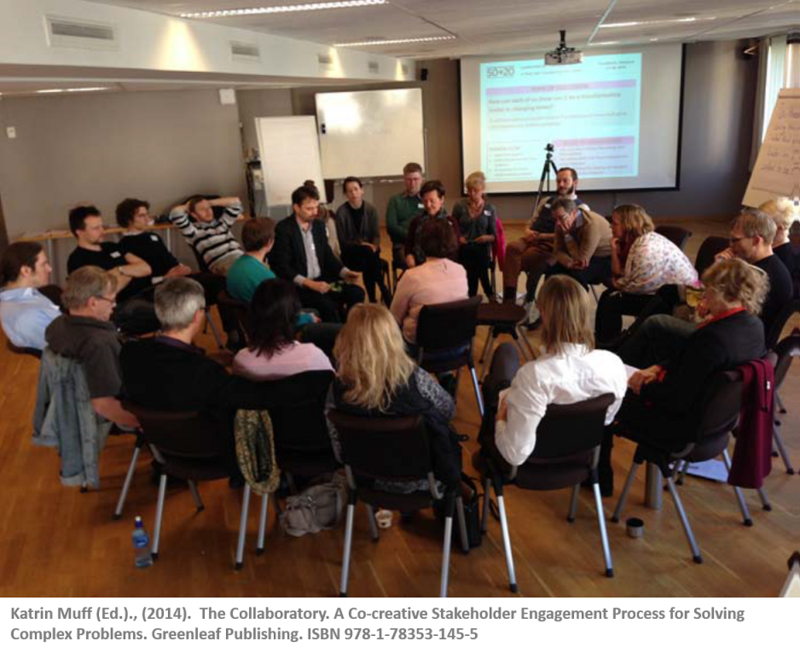 A Co-creative Stakeholder Engagement Process for Solving Complex Problems'. Click here for an excerpt of this book. In this short article by Gervase Bushe & Robert Marshak the identify the core elements of this Dialogic OD approach based on social construction. In these video fragments people talk about approaches and methodologies that fall under the broad category of 'Co-Creation'. Most organizations today, are still build on the paradigm of 'predictability', the separation of thinking and doing, the need for well defined tasks, jobs and responsibilities and a vertical 'steering mechanism'. So it is absolutely normal that when you invite stakeholders to take their future in their own hands, it will be difficult, it will go wrong from time to time and it will create confusion, stress, fear maybe. Their first reaction might be : 'sitting on the fence', create even more distance, not participate, try to push the monkey back, start complaining about everything, etc...And then the risk is very real that management or those who took the initiative to introduce co-creative ways of working start to take over again themselves... 'since nobody else does it' and in doing so create a 'vicious circle' in which the stakeholders are even less inclined to take ownership. So give it time, start small.. so people can try things out and give them the reassurance that it is 'for real' (and not the CEO at the end who takes decision without taking their work into account). Leaders and managers often feel 'less valued' or 'not needed anymore' in a co-creative setting. That is an absolute misunderstanding. Mangers are of course important to participate in this process because of their knowledge, expertise, experience, networks, etc... But they also have a role to play as coach and process facilitator of the co-creative dynamic. The process need to be facilitated, individuals and teams need be supported in this way of working as well as the managers need to be coached in their new role. A good logistic support and powerful online tools to work together, certainly in virtual teams and multi-site international organizations is very important. Assume everybody can be creative and so invite the 'idiots' over (The word 'idiot' is used in the sense of somebody who doesn't know yet that something is not possible). Don't forget that there is not 'one objective experience' everybody's experience is different and that difference is the road to innovation. Marvin Weisbord & Sandra Janoff., (2003). Three Perspectives of Future Search. Co-Creation, New Pathways to Value.